Welcome to the Music Department at Delbarton School! Please take the time to navigate through the sections of the music department page to find information about upcoming concerts, participation in our ensembles, private lessons, news stories, and information about our music faculty. At Delbarton School we are extremely proud of the quality and diversity of our Music Program and Performing ensembles. There are a wide variety of ensembles designed to invite beginners to get involved and to challenge even the most serious minded music student. All of our programs and ensembles are designed to be positive experiences which will nurture the development of young musicians, and foster a lifelong love of music. Several of our performing ensembles are open to musicians from surrounding schools. We are always excited to have new musicians join us year to year and share their talents with our student body. As a community we also strive to come together to enjoy each performance making us better consumers of music and showing our appreciation and support for the hard work of each student musician. We hope to see you all performing on the stage or enjoying the artistry from the seats in the audience! WANTED: Used wood + wind instruments! Donate to Delbarton's Musical Instrument Drive Monday April 15 to Friday April 26. Look for bins outside FAC Band Room. Your generosity will allow our students to try (risk-free) new instruments and expand their music options! The Abbey Orchestra numbers some seventy players including both Delbarton students and community musicians. The group performs works from all corners of the traditional repertoire at four concerts each year. Recent repertoire has included: Schubert’s Unfinished Symphony, Beethoven’s “Eroica” Symphony, and Tchaikovsky’s 5th Symphony. This orchestra sets itself apart from many by the ambitious repertoire they perform, and the hardworking, talented, and sensitive musicians involved in the program. The Abbey Orchestra is open to students in all grades as well as community members. A placement audition is held for new members. The Men’s Chorus at Delbarton School pursues an active concert schedule throughout the school year performing alone and with choirs from other schools. In addition to seasonal concerts, Schola Cantorum performs at school liturgies, and other campus events. The Schola Cantorum is intended to provide new singers all they need to discover their voice and grow in their ability as well as challenge and inspire our advanced singers. Repertoire for this ensemble includes sacred and secular music in a variety of styles, historical periods, and languages. The Delbarton Brass Ensemble consists of trumpet players, trombonists, tuba players and all other brass instrumentalists. The group performs a repertoire that ranges from the ancient to the modern and gives concerts throughout the year. Open to Delbarton students in all grades. The Delbarton Wind Ensemble performs varied music from the Wind Band Repertoire. Selections are meant to challenge, educate, and inspire our musicians. This ensemble is a wonderful mix of Delbarton students, surrounding schools and musicians from the community. The ensemble presents four concerts throughout the year and is open to all students 7th grade and beyond. The Delbarton Woodwind Ensemble performs various repertoire from the Woodwind Quintet, and Saxophone Quartet Repertoire. Open to flute, Oboe, Clarinet, Bassoon, and Saxophone students. The Delbarton Jazz Ensemble is a traditional Big Band of approximately 16 pieces. The group performs the works of Duke Ellington, Count Basie, Thad Jones and other great composers of jazz. Open to Delbarton students in all grades by audition. The Delbarton Percussion Ensemble numbers approximately 12 musicians who perform on a wide variety of percussion instruments. In addition to experienced percussionists, musicians who have played other instruments, especially the piano are welcome. This can be a great opportunity for students who have no musical experience if they are willing to take private percussion lessons. The Ensemble performs at the Instrumental Concerts throughout the year. This is a smaller auditioned vocal group focusing on a cappella vocal music from pop, jazz, rock, and barbershop influences. This ensemble is geared towards more experienced singers capable of reading music well and singing confidently without accompaniment. Students in this ensemble are also encouraged to study, write, and prepare arrangements in order to teach and direct them with the ensemble. Each year we bring together an incredible pit band to play the musical score for the Winter Musical Production. This is a unique experience to play challenging music in a short time frame. Student musicians are supplemented with professionals from the area who have experience playing countless shows and some have played shows on Broadway. Instrumental parts are distributed in the beginning of December and rehearsals occur in January. If you are interested in being a part of this approach Mr. Blazier as soon as possible to reserve your spot! 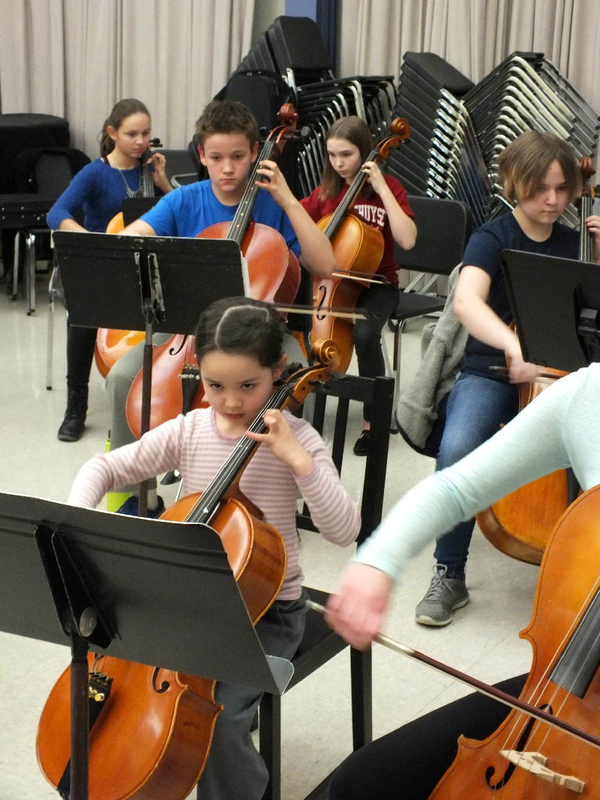 The Young Abbey Orchestra caters to younger string players who seek to expand their musical experiences. Ms. Tomblin challenges these players to grow in technique and musicality while studying great music literature. The group gives four concerts each year. Open to students in all grades as well as outside community members. The Rock Band Club is open to all instrumentalists and vocalists who are interested in learning more about playing and performing this style of music. This club usually meets once a week after school to rehearse and has performed in the past at theater productions and coffeehouse gigs. Open to Delbarton students in all grades. Rehearsal is every Thursday afternoon from 2:35pm to 3:45pm in the Instrumental Rehearsal Room. “Arma Lucis” (“The Armor of Light”) is our Liturgical Music Ensemble focusing on healthy singing and the best of sacred choral music from all periods. This ensemble will study chant, canons, early music, both a cappella and accompanied pieces while preparing for concerts, school masses, and the occasional Sunday Liturgy at St. Mary’s Abbey. Private study is a critical part of any young musician’s development. We strongly encourage each of our musicians to study with a private teacher to further the student’s musical development, increase individual confidence, and experience the discipline necessary to achieve excellence in his art. This one-on-one mentoring relationship is an extremely important teaching tool to show a student what it means to be a musician. Private teachers are available most days after school and into the evenings. If you have questions or are seeking a recommendation for a private teacher for your child, please inquire with Mr. Blazier or speak to your child’s ensemble director. *Some instructors may have a different fee structure. Please discuss scheduling, payment, and rates with the private teacher prior to beginning lessons. Lesson billing is handled by the Delbarton School business office, and families will receive a monthly bill for lessons. As a courtesy please contact your private instructor more than 24 hours in advance of a missed lesson. If a student regularly misses a scheduled lesson the student may have to sacrifice his lesson time to another student. We never want financial need to be a reason for a student not participating in the music program or studying privately. There are scholarships funds in place for families who express a need. Contact Mr. David Blazier to find out more about these opportunities. Read more about Spirit Week Video! Meet the cast of the Abbey Player production of Into the Woods on stage at Delbarton this Feb 9,10 and 11!